EvoLogics GmbH develops underwater information and communication systems based on bionic concepts, combining cutting edge engineering with the best ideas found in nature. The advanced product features have become enabling technologies for deep water exploration and production. EvoLogics range of products offers highly reliable, flexible and cost-effective solutions for multiple underwater communication, positioning, navigation and monitoring applications. The company strives for innovation and invest our vast experience into developing, manufacturing and supporting products that deliver an excellent performance and solve the most challenging tasks. The company was founded in 2000 in Berlin, Germany, by a group of leading international scientists and maritime engineering experts. The company focuses on developing innovative solutions for maritime and offshore industries, as well as smart robotic systems design and bionic research. EvoLogics’ products offer highly reliable, flexible and cost-effective solutions for multiple underwater communication, positioning, navigation and monitoring applications. EvoLogics’ developments are based on the patented S2C (Sweep Spread Carrier) technology - the reliable acoustic telemetry that provides an independent bidirectional data link along with positioning, broadcasting and networking capabilities. S2C devices can simultaneously facilitate telemetry and navigation of unmanned underwater vehicles. They enable retrieving information from various sensors and allow the user to control complex processes by seamlessly combining communication with highly accurate positioning. 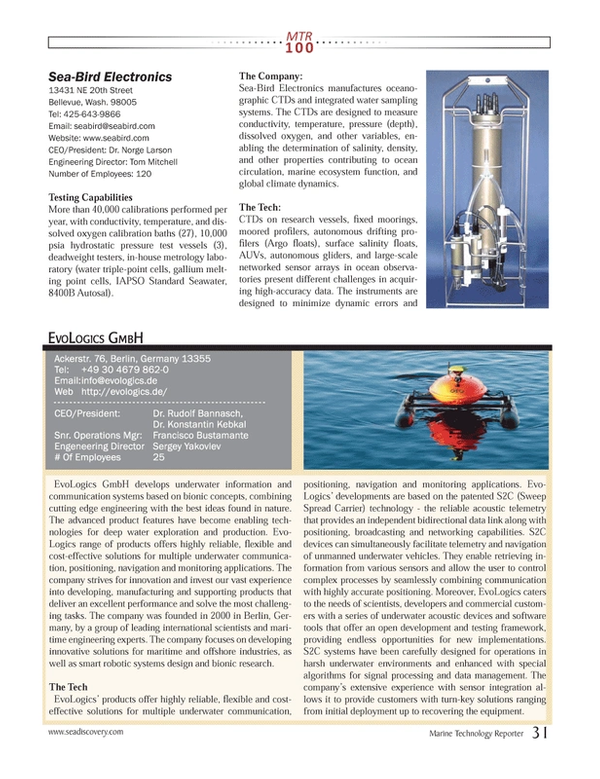 Moreover, EvoLogics caters to the needs of scientists, developers and commercial customers with a series of underwater acoustic devices and software tools that offer an open development and testing framework, providing endless opportunities for new implementations. S2C systems have been carefully designed for operations in harsh underwater environments and enhanced with special algorithms for signal processing and data management. The company’s extensive experience with sensor integration allows it to provide customers with turn-key solutions ranging from initial deployment up to recovering the equipment.